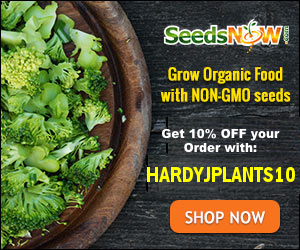 We have partnered up with SeedsNow to offer you raw, untreated seed for 10% off! Just enter HARDYJPLANTS10 at checkout to receive 10% off your entire order. In return, we receive commission for your order. Please order by clicking the banner below so your order is credited properly. Use code HARDYJPLANTS10 at checkout to get 10% off your order. Image above not displaying? Go to http://www.seedsnow.com?rfsn=231249.5aac6* to purchase seeds. By using this link, we may receive commission for your purchase. Copyright © 2015 – 2019 Hardy J Plants · All Rights Reserved. * By clicking this link, you are leaving Hardy J Plants' website; this link is provided for convenience and informational purposes only and it does not constitute an endorsement or approval of any of the content on the external site by Hardy J Plants. Hardy J Plants bears no responsibility for the accuracy or legality of the content on the external site. Please contact the external site for questions regarding its content. ** Unless otherwise indicated, all plant information was retrieved from myfolia.com. Used by permission.